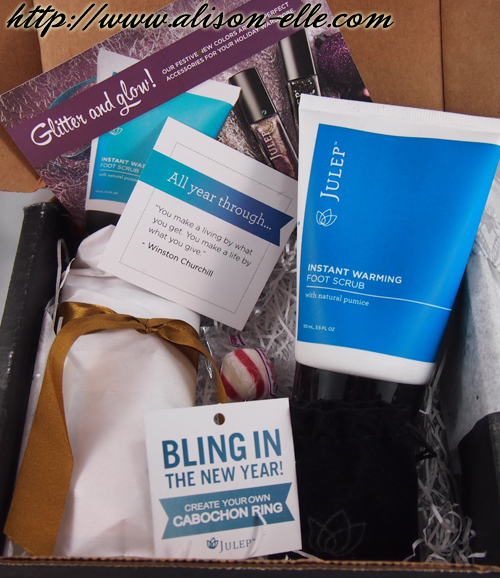 As a Christmas treat, Julep sent me one of this month's Julep Maven American Beauty Boxes. Unlike June's IT Girl Box which was full of bright and summery shades, all the December boxes feature gorgeous glitters that are perfect for the holiday season. The packaging was simple but festive, with snowflake tissue paper and white paper shavings acting as a bed of "snow." In addition to two nail polishes, Julia and Patti, I received Julep's Instant Warming Foot Scrub which smells like cucumber mint. 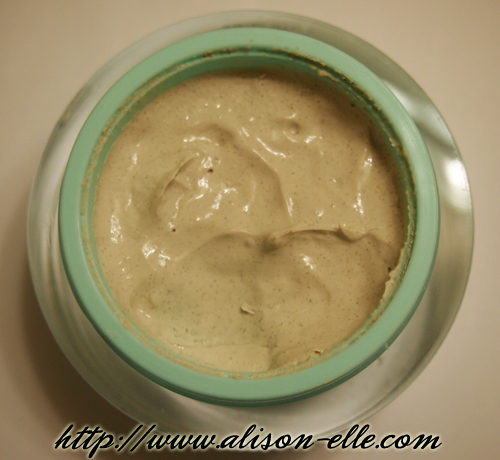 I love foot scrubs and this will be perfect for at-home pedicures. 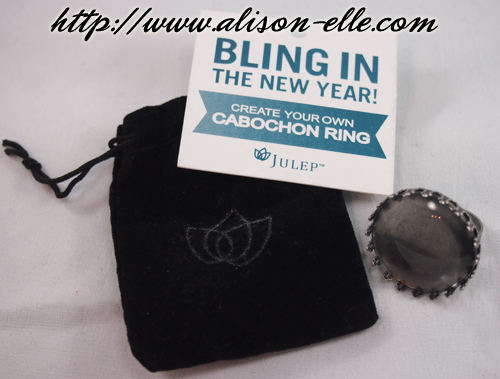 December's boxes also came with a peppermint candy and a "Create Your Own Cabachon Ring" kit. I've seen nail polish rings being sold on other sites before and I love that this was included. Basically, you can paint the cabachon your favourite nail polish colour and pop it into the ring base for a one-of-a-kind accessory. I was most impressed, however, by the nail polishes. Patti is described as a full-coverage black multi-dimensional glitter. You need three coats to reach opacity but the silver glitters do add some extra pizazz. But the stand-out colour, in my opinion, is Julia. It's described as a purple orchid with golden micro-glitter metallic, but that doesn't even come close to how complex this colour really is. The duochrome is absolutely beautiful; in some lights it looks more purple while in others it looks more gold. After finishing this mani, I seriously could not stop staring at my nails. So pretty! In semi-related musings, can you believe that we're basically a week away from 2013? December is always insanely busy but this year has been especially so for me. My flight home from Calgary was delayed for over 4 hours on Wednesday due to a snowstorm in Vancouver that left the city in chaos. People trying to get to Vancouver were about ready to revolt. It's funny how things like that really bring out the worst in us. And with barely a few days home I'm now off to Singapore for Christmas (check out this post for pictures from last year's trip). Preparations for all this flying have been very stressful! I hope all of you have a lovely winter break... HAPPY HOLIDAYS!! I managed to snag this utility jacket during a store close-down sale a few years ago for only $10, and since then it's been a very happy addition to my wardrobe. I wore it a ton during the Paris leg of last year's Euro-trip and just love the way it pairs effortlessly with all my favourite layered looks. If you don't already own your own version of this jacket, what are you waiting for? This one's a workhorse! Here are some options similar to mine (though unfortunately not $10 - sorry! ): Love 21 Faux Fur Collar Utility Jacket, ASOS Popper Parka, and Talula Trooper Jacket. I've been attending a series of barre fitness classes over the past month and maybe it's the new ballerina in me (okay, I admit that calling myself a "ballerina" is stretching it just a bit) but I've been really into the whole hair bun thing lately. As you know, I pretty much never wear my hair up, so this is kind of a big deal. Because my hair is super fine, my ponytails/buns always end up a little sad-looking and regular sock buns don't work well either because I don't have thick enough socks. Thankfully "hair donuts" exist. Hair donuts are these mesh/velcro donut-shaped things that you can create buns with using the typical sock bun method. However, they come in different sizes and colours to match your hair (plus you can find them on eBay for only 99 cents). But the best part, in my opinion, is that you can't even tell that my bun is basically 90% apparatus and 10% hair! 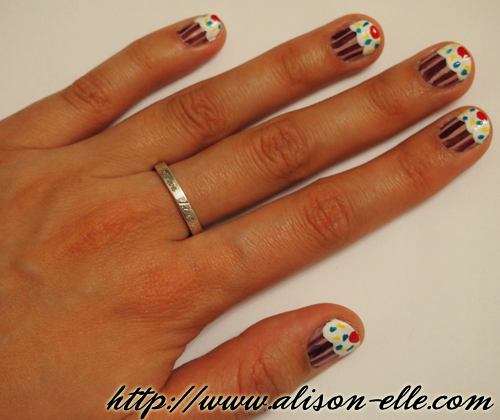 Apparently it's nail polish week here on the blog (check out my cupcake nail art tutorial if you haven't already). 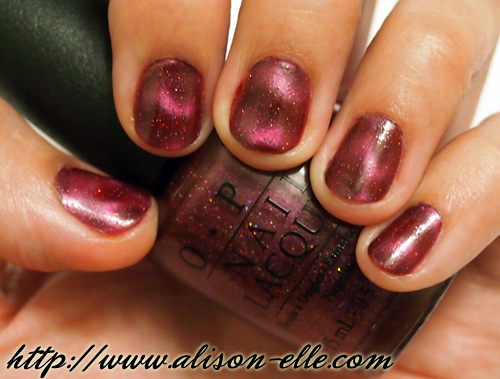 This post features Morning, Moneypenny, which is part of the recent OPI Skyfall Magnetic Lacquers Collection. The Skyfall Collection celebrates the 50th Anniversary of the James Bond enterprise and is full of gorgeous colours that are perfect for the holiday season. 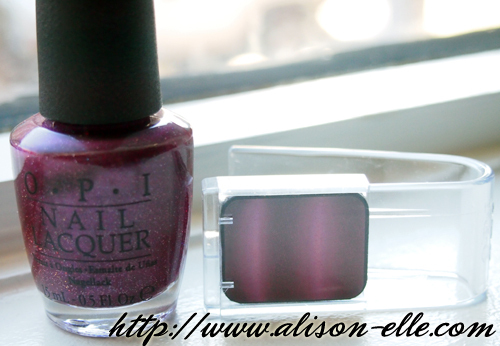 In addition to the 12 regular polishes, OPI released a set of Pure Lacquer Nail Apps and 3 Magnetic Sets. Magnetic polishes have been very popular this year but I personally hadn't found any I was too intrigued by. However, when Vervegirl asked me to review this polish, I figured now was as good a time as any to give them a go! OPI's Magnetic Set is different from a lot of other magnetic polishes I've seen because it includes a unique and easy-to-use plastic magnetizer that you slide your finger into to create the design. I thought it might be useful to show you guys how the magnetizer works so I've created this quick tutorial. As a note, with magnetic nail polishes, it's best to do one nail at a time since you want to ensure the polish is still wet when you're applying the magnet. 1. Apply two coats of Morning, Moneypenny to the nail. 2. 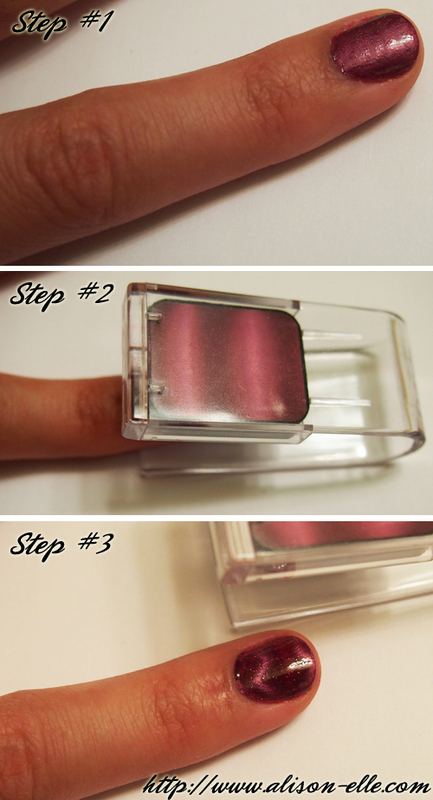 While the polish is still wet, place your finger onto the bottom of the magnetizer with the magnet positioned over the nail. Press the top side down until the edge touches the finger below the cuticle being careful not to touch the nail with the magnet. Hold for 10-12 seconds. 3. Release the magnet and pull it away carefully to reveal the design. 4. Finish off with a top coat since the polish does finish a little gritty. Interestingly, the design revealed looks more like a chevron pattern as opposed to the picture shown on the magnetizer. I think I actually like the chevron effect more anyway, and I love the extra dimension this polish gives to my nails. Looks like I'll need to pay more attention to magnetics from now on! It's been a while since my last nail art tutorial (see my gradient nail tutorial and leopard print nail tutorial), so I'm super excited about this one... Cupcake Nails! Aren't they cute? For this tutorial, I used a number of products from AVON and Vervegirl, including the new Nail Art Enamel which will be available as of January 2013 through AVON Independent Sales Representatives, 1-800-265-AVON, or online. These small polishes come with a precision brush for more detailed nail designs. If you don't have nail art polishes, however, don't worry! You can just use regular nail polish with a small paint brush or a toothpick might even work for the cupcake wrapper, cherry, and sprinkles. Before you begin to create your cupcakes, you may want to start off with a base coat. 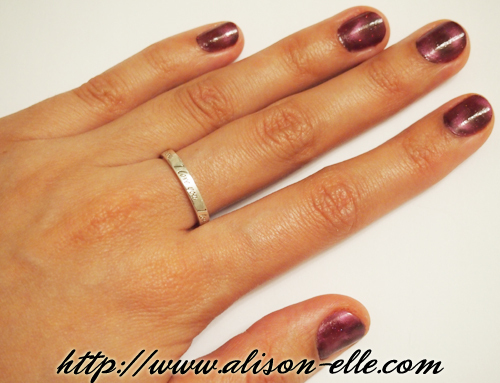 I used AVON Gel Strength Base Coat. 1. Paint your nails the base colour and let dry. 2. 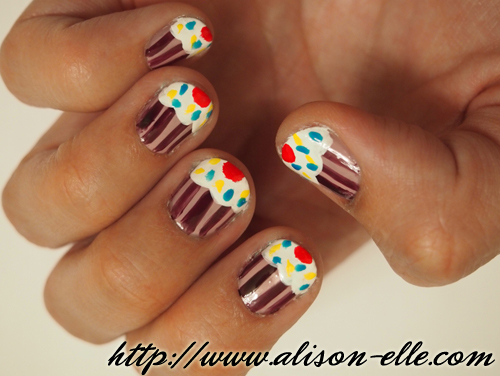 Create the cupcake wrapper by drawing thin lines from the base of your nail upwards. 3. Add the icing by painting "clouds" from the tips of your nails to a little less than halfway down. 4. Dot on a cherry at the very tip of the icing. 5. Add different coloured sprinkles in a random pattern. Lastly, finish off with a top coat to protect your hard work. I used AVON UV Gloss Guard Top Coat. One thing to note is that this particular mani works best if you have rounded nail tips like mine. If you have square tips, you can simply reverse the cupcake orientation to have it facing out and it works great that way too. As always, please let me know if you try out this tutorial. I'd love to see your versions! Ever since being introduced to Lise Watier, I have been consistently impressed with the quality of their products and the beautiful colour stories they come out with each season (see my last FOTD post featuring their Fall Collection). Their Winter 2012 Collection, GLAMOUR ROSE is, of course, no exception. From the intricate designs etched into the pressed powders to the luxe packaging, it's easily apparent what inspired this collection: the rose. Lise Watier sent over some items for me to test out and after experimenting with the rich shades and creamy eyeshadows, I decided to create my version of a holiday party FOTD. 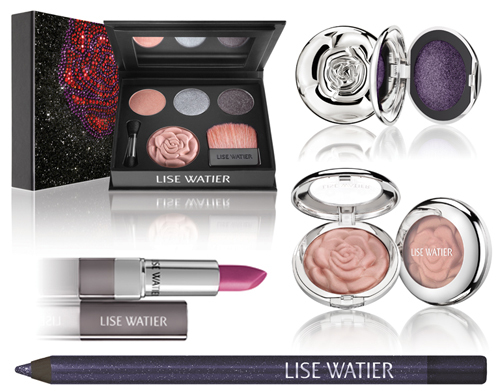 Lise Watier's GLAMOUR ROSE Collection is available until January 2013. See the rest of the collection HERE. Last week was no fun, my friends, no fun at all. I spent most of it suffering from what was likely salmonella poisoning before I finally ended up in Urgent Care bawling my eyes out with an IV in my arm (I hate needles). So let's just say I am pretty glad that it's a brand new week. Things can only go uphill from here, right? While we're embracing happier thoughts, I also happen to be guest blogging on Style Rhapsody today while the lovely Marisa is off enjoying some much-needed sun in Cabo San Lucas. 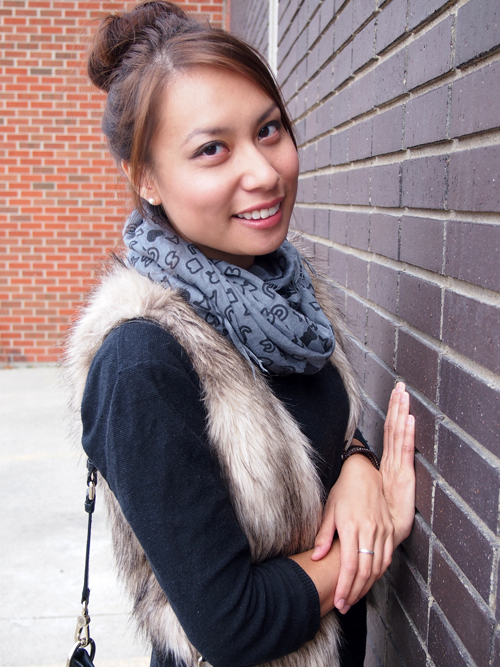 Be sure to check out my post here for more pictures (taken pre-salmonella, of course) and outfit details. Question of the month: What are 3 of your favourite things you've learned from other blogs/Youtube? Blogs and Youtube are such great sources for inspiration and new knowledge... in fact, I've learned so many things from both that it was hard to narrow it down to just 3! 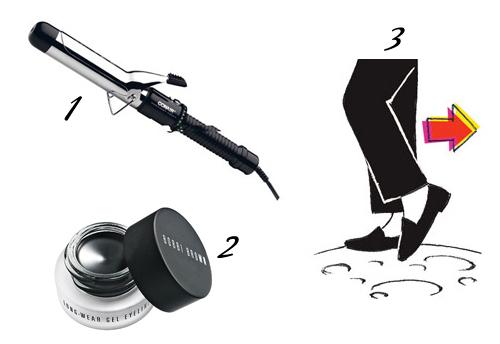 Even though a curling iron is now my go-to styling tool, there was once a time when I had absolutely no idea what I was doing. This video by MakeupByTiffanyD was the first one I ever watched. Tightlining makes a huge difference because it fills in the gaps between your lashes and is a great way to add some subtle definition to your eyes. When I first heard about the process a number of years ago I was super confused so naturally took to Google in search of answers. I can't remember the exact site I ended up on but this Makeup for Life tutorial breaks down the steps really easily. In my first year of undergrad, my friend and I spent countless hours trying to teach ourselves to do all sorts of cool dance moves when we probably should have been studying for our exams. We watched videos on moonwalking, house stepping, and hand waving, and practised in front of the mirror in our rez floor bathroom. Unfortunately, 8 years later I am left with little talent to show for our efforts! P.S. 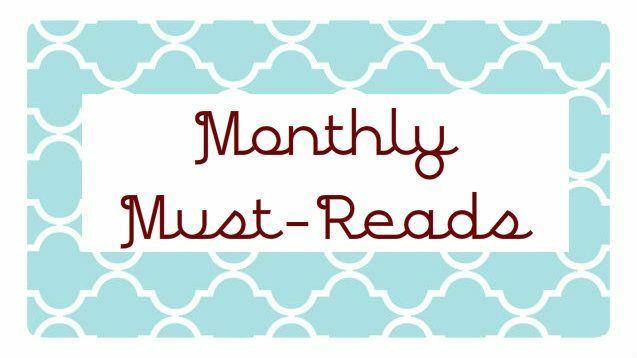 Don't forget to check out the other girls' answers to this question and their must-reads for the month of November! 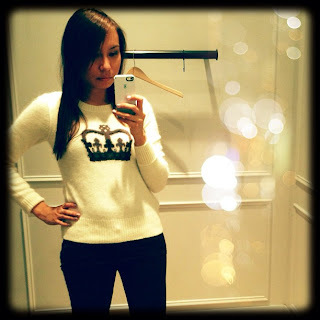 Alison*Elle - Alison has found her perfect sweater. 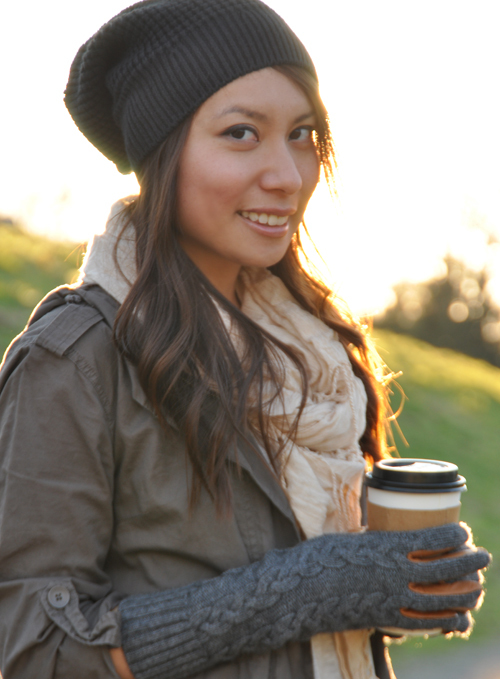 Beautygirl24 - Noelle was finally able to layer for the chilly weather, and decided to try it with burgundy and fuchsia. Ella Pretty - Ella shares recent outfits and her Black Friday purchases. Lindsay J Everyday - Lindsay debuted her new bangs and found a new love for glammed up collars! 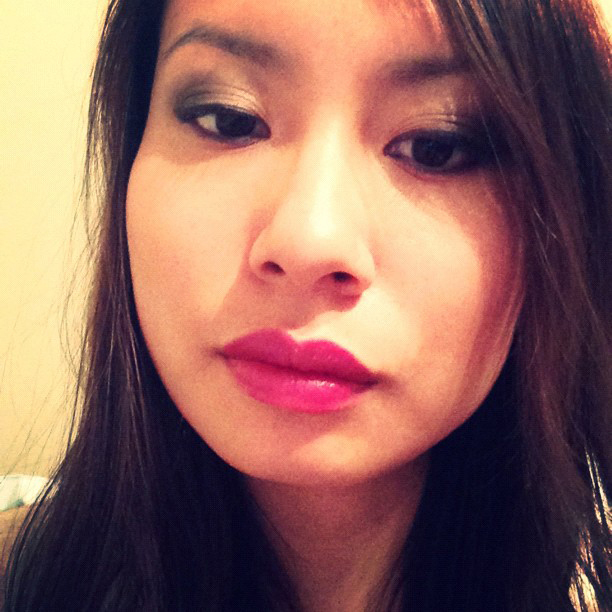 Love, Lipstick & Pearls - Kristen is ready for the holidays and has her wishlist made! Schnelle Couture - Danielle has popped and is making the most of her pregnancy style. Sequins and Stilettos - Skylette is remixing a summer silk tee by adding a dark blazer. 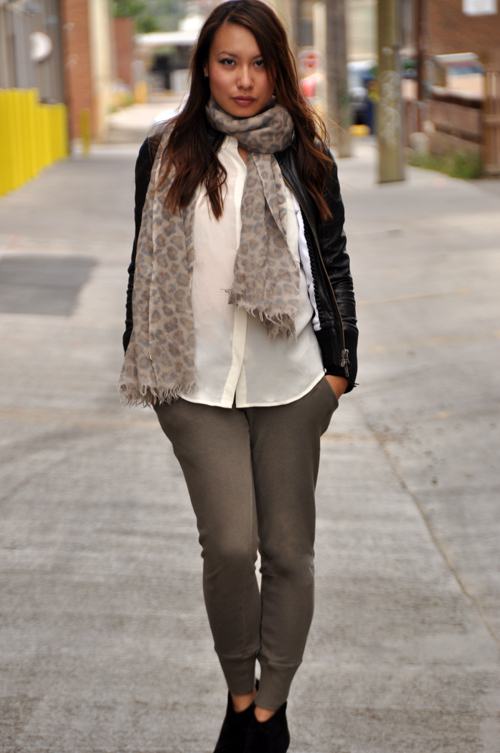 The Currently Obsessed - Mehreen is preggers and is taking us on her journey! FUN is the latest invention from LUSH Cosmetics. A multi-purpose moldable soap, you can use it to wash your hands and body with, create masses of bubbles to bathe in, or even wash your clothes. YELLOW FUN ($6.95 for 250g): Creamy vanilla tones and gardenia extract gives this bundle a comforting marzipan aroma. GREEN FUN ($6.95 for 250g): A citrus burst of tangy lime and lemon essential oils that will make you feel refreshed and focused. BLUE FUN ($6.95 for 250g): Relax and feel ready for sleep when you wash with this mix of lavender and chamomile blue essential oils. 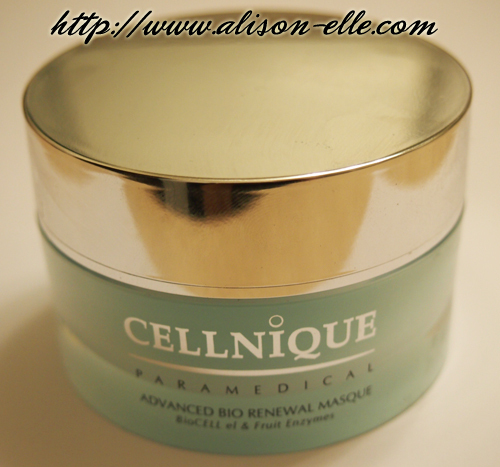 The perfect bedtime bath; also great for irritated skin. RED FUN ($6.95 for 250g): A fruity combination of orange and mandarin oils that will revitalize the mind and bring a bit of summer sun to the bath. PINK FUN ($6.95 for 250g): A sweet treat with ice-cream scented tonka absolute and benzoin resinoid, which also has warming qualities to help stimulate circulation. 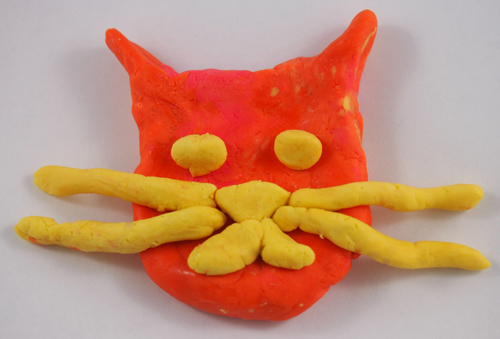 As you can see, I was sent Yellow FUN and Red FUN (which looks more orange than red to me) to experiment with. Yellow has a very pleasant scent but I preferred Red for its sweet citrus notes. You may have also noticed the Japanese writing on the packaging. This is because LUSH inventors felt compelled to give something back after the nuclear disaster that occurred in Fukushima, Japan last year left whole residential areas contaminated (and children unable to play outside). So with every purchase of FUN, LUSH will donate 2.5% of total sales to the FunD, giving money to local charities in Japan working towards giving children safe places to play in Fukushima! You can find FUN in stores or online. I've been wearing this sweater at least once a week (if not more) since I got it over a month ago. 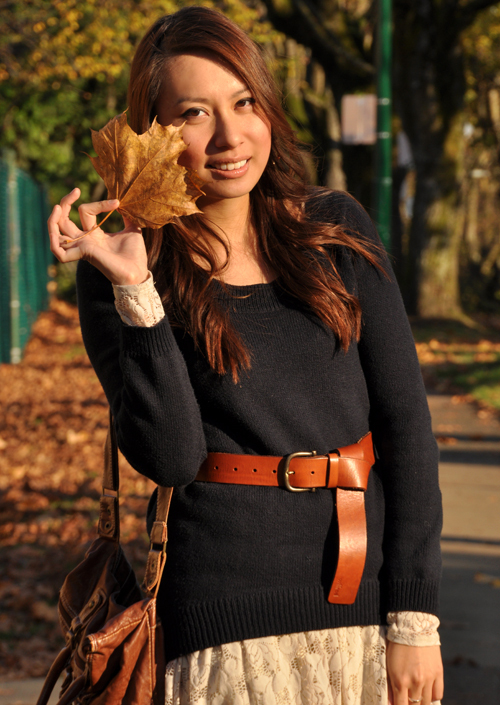 It's basically everything I love in a sweater: leather detailing, interesting shape, and very much my style. And how fun are my new House of Harlow 1960 Triple Skull Stud Earrings? I tend to wear the same basic mini-hoops all the time because I'm too lazy to take my earrings off every time I shower/sleep and put them back on again. Hmm... that makes me sound kind of lazy... I suppose I probably can spare a few extra seconds and mix up my earring repertoire a bit! By now I'm sure most of you have seen the new Instagram web profiles. Personally, I think it was about time they were introduced. Plus, I love the layouts with that fun changing header! Be sure to check mine out HERE (my username is alison_elle). 5-Pin Bowling & a strike in my first round! Following up on my previous post about LUSH Cosmetics' makeup line, Emotional Brilliance, here is my long overdue review of the products I received at the pre-launch party. Better late than never, right? First up are my favourite products from the collection: the Liquid Lips. In particular, I am loving Glamorous, which is a wonderful Barbie pink. It reminds me a bit of the MAC x Nicki Minaj lipstick Pink Friday but less pastel or maybe MAC Candy Yum Yum but less neon. Interestingly, my boyfriend, who is not usually a fan of bright lipstick, has told me numerous times that he loves this. I agree; it is a pretty fun colour. The Liquid Lips are made with jojoba oil, rose wax, and a candellila wax base to soften dry lips. The texture is quite light, almost like a gloss. 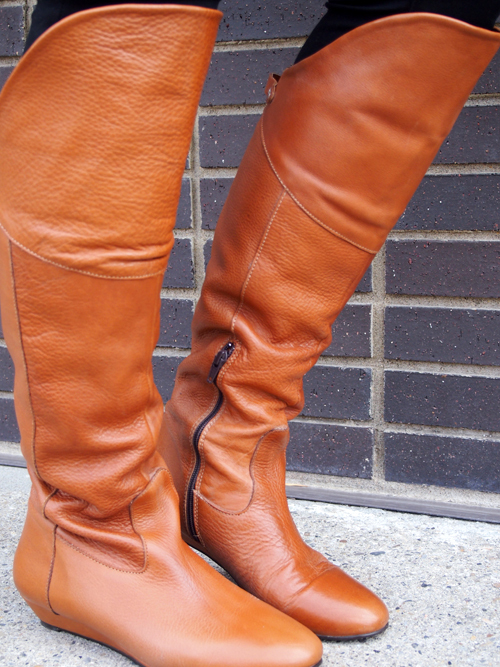 I do personally find the formula to be a bit on the slippery side, so it's not super long-wearing. Nonetheless, there is a good variety of shades and as an added bonus: all the liquid lipsticks can double as cream blushes! My second colour, Perspective, is a lovely dusky rose with a slight golden sheen. It's a very wearable everyday shade that I like a lot. Next up is the Liquid Eyeliner. I have Motivation, which is a dark peacock blue/teal. I really like the colour because it's bright and pigmented (this can actually be said about all the colours in the Emotional Brilliance line). Of the Liquid Eyeliners, only two (Independent and Fantasy) have a no-smudge, stay-put formula. The other eyeliners are made with a formula that allows you to blend to create a softer look if you want. While this means you can also wear them as eyeshadows, if you're wanting a simple liner you have to make sure it dries properly or it will smudge. As someone who doesn't use liquid liner very often (I prefer pencils), I found this product very easy to use. The shorter handle makes it easier to apply, especially if you are making a winged cat eye. 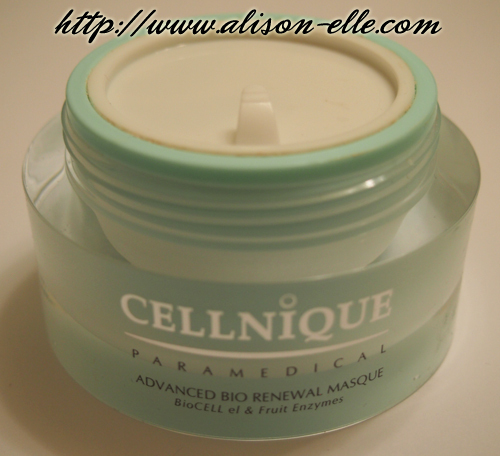 The formula is not waterproof but lasts fine all day with some minor flaking towards the very end of the day. 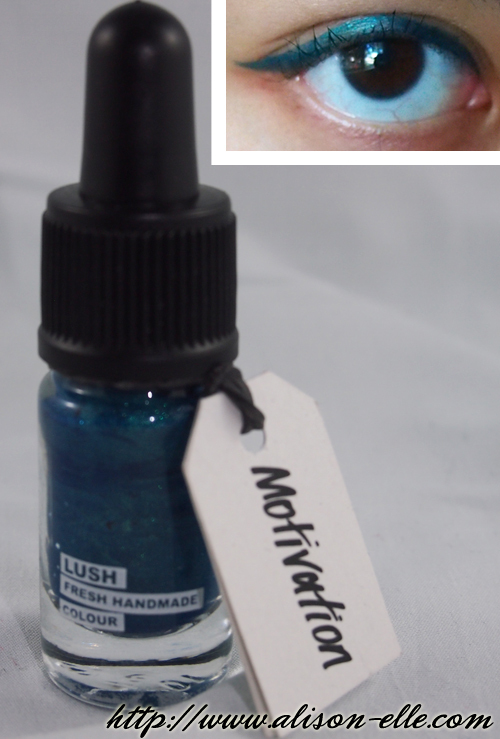 Lastly, I have the Eyes Right Mascara, which I'm wearing in the Motivation swatch picture above. LUSH claims that it's a "gentle mascara that can be worn by those with even the most sensitive eyes." I thought this was odd because this mascara irritated my eyes a ton. Maybe I'm allergic to wheatgrass, which is the key ingredient in this mascara. Aside from the wheatgrass, Eyes Right contains only one preservative (while most mascaras on the market contain between 4-6). 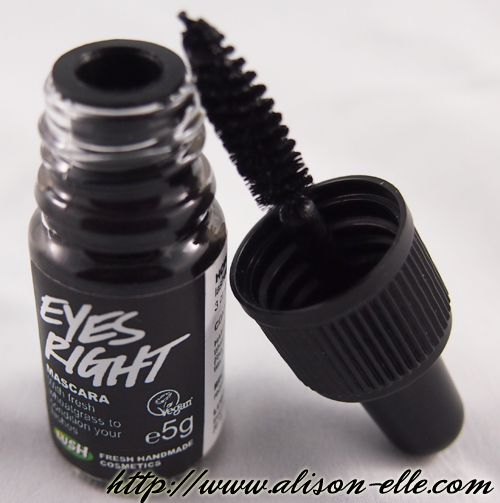 Eyes Right comes with a very short handle that makes it extremely difficult to apply. Furthermore, the formula is not waterproof and it doesn't hold a curl on my straight Asian lashes. All in all, I find this to be a very basic mascara at best and while I like the idea behind the product it unfortunately was a fail for me. And that's my Emotional Brilliance round-up! The products are kind of pricey ($22.95 CAD for the Liquid Lips and Liquid Eyeliner, $18.95 CAD for the Eyes Right Mascara). However, I think LUSH is filling a much-needed niche for vegan-friendly makeup and the highly pigmented shades at least make it worth a look. Not only do I wear these "fashion sweatpants" at home, but I have absolutely no qualms about wearing them in public. And no, not just for a quick grab-and-go grocery store run. I am talking about the full on, day-out-on-the-town, everyone-can-see-me type of wearing in public. Now, I know you're probably thinking to yourself: "could this girl commit a bigger fashion faux-pas?" The answer is obviously yes... I mean, have you seen those awful Croc/UGG hybrids? Shudder. By the way, I hope you all remembered to change your clocks back! I was super grateful for the extra hour of sleep before my early morning yoga class but at the same time, it's a little upsetting to know that from now on it's going to be dark at like 4 p.m.